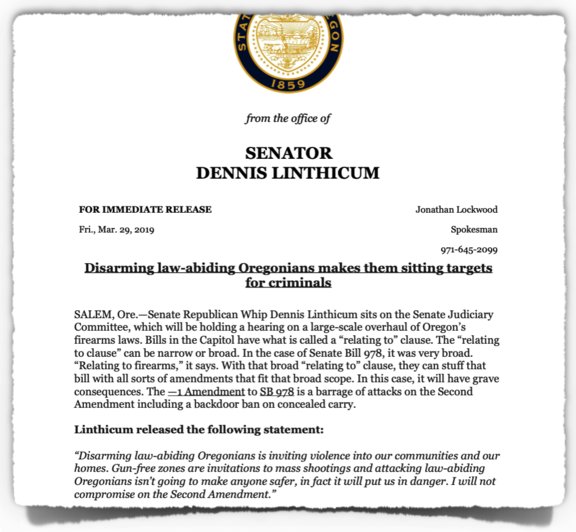 Senator Dennis Linthicum: Land of Liberty? Every perceived problem seems to get a new law drafted. The state tries to mandate solutions to even the smallest problems. Yet, their solutions rarely work as intended. People aren’t allowed to solve their own problems they are forced to depend on the state’s bureaucratic experts. In turn, the individual is diminished, while the state is emboldened. Civic responsibility is weakened, and the quality of community and family-life is eroded. Lewis goes on to describe how his symbolism pictured, “an official society held together entirely by fear and greed.” In essence, fear of the government’s regulations (and its regulators), with their ever-growing threats of fines and/or imprisonment causes people to be protective, suspicious and secretive. After all, who can know what traps have been set? In the Senate Judiciary Committee, on April 2, a slew of anti-Second Amendment proposals is scheduled for public hearing. These proposals are trumpeted as “necessary” for “safety”, but we all know that’s a ruse. In this case, the forty-four-page amendment to SB 978 is an full-scale barrage against the Second Amendment including a backdoor ban on concealed carry. This law violates the inalienable right of all Oregonians to defend themselves and their families. Disarming law-abiding citizens is inviting violence into our communities and our homes. Gun-free zones are invitations to mass shootings and attacking law-abiding Oregonians isn’t going to make anyone safer. In fact, it will put us in danger. I will not compromise on the Second Amendment. SB 978, on Tuesday, April 2nd, will focus on a myriad of issues regarding possession, personal firearm management, and the buying, storing and selling of firearms. If you value your firearms and your Second Amendment right to keep and bear arms, then please get involved. Send an email to every Democrat in the House and Senate. Phone every Democrat in the House and Senate. The pro-Second Amendment Republicans are in the minority and we will need a few Democrats to vote with us in order to stop these bills. Light up their phones and clog their inboxes with emails, otherwise there is great potential that we will slowly lose our legal protections regarding our Constitutional Rights. It is the argument of tyrants. It is the creed of slaves. p align=”left”>Remember, if we don’t stand for rural Oregon values and Common-sense – No one Will.